Ripped Up Nutrition (RUN) protein Coffee is protein infused premium coffee that claims to be more than just your average beverage. 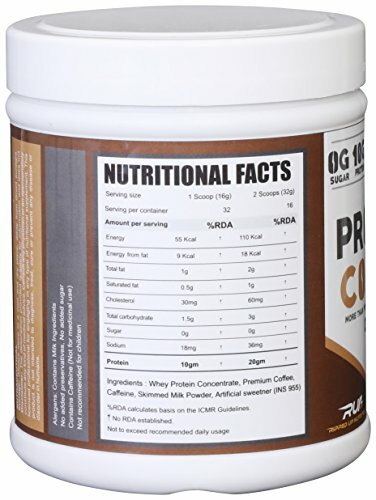 Each serving of RUN Protein Coffee gives you 10 grams of pure whey protein concentrate. Ripped Up Nutrition Protein Coffee is designed as an ‘any time fuel’. 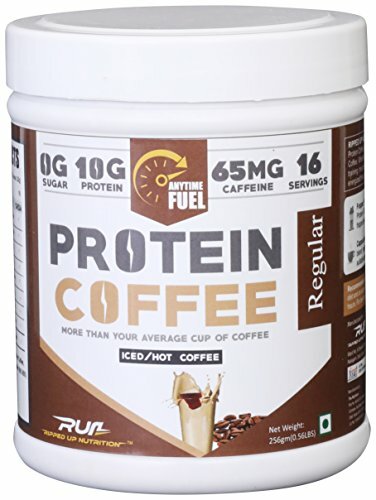 Be it before your work out or between the long office hours, RUN Protein Coffee will keep you energetic and ripped up for sure. Caffeine: Caffeine is responsible for that added energy and alertness that you get after having coffee. Each serving of 16 grams gives you 65 mg of caffeine to keep you active throughout. Now, athletes who are looking for a protein source that can help them in sizing up and accelerate muscle recovery; this is NOT the product for you. The product does not provide any significant amounts of BCAA, EAA or Glutamine that can assist you with your specific requirements. The product label states that it does not have any sugar (table sugar) but it has artificial sweeteners, none the less. Overall, we can say that for a fortified coffee, the product is good. It will definitely add a good chunk of protein to your daily routine. However, as a mainline protein supplement, it will definitely not fit the bill. Ripped Up Nutrition Protein Coffee is available in 4 delicious variants – Regular, Caramel, Mocha and Hazelnut. 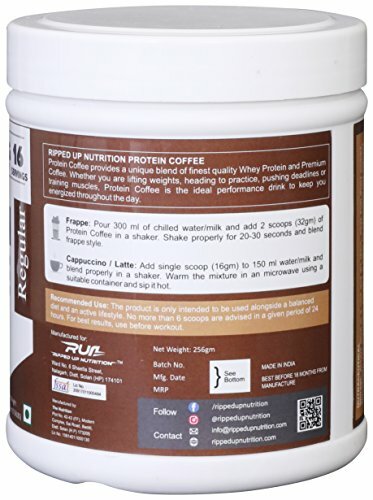 Whey protein’s natural milk powder like taste blends well with the coffee and its exotic flavours. You can use it for your lattes and frappes or any other way that you like. Users have reacted positively towards the taste of the product. Ripped Up Nutrition is expected to accelerate your metabolism and compel your body to use fat as the primary source of energy. It therefore, promotes fat loss and aids muscle gain (with its protein component). Coffee also improves concentration and energy, making this product a valuable pre-workout drink. However, one might need to use multiple scoops (2 to 3) to get the desired amount of protein. As a post workout meal or shake, this is not that desirable due to lack of Glutamine and BCAA. Also, having more than 2 to 3 scoops in one serving will add to the caffeine and carbs and is not feasible economically too. Hence, when it comes to its effectiveness, it is great for people who are struggling to make up for their protein content due to prolonged office hours or poor diet. It will boost the metabolism, provide protein and may promote a healthy physique. How it fares as a support to bodybuilding enthusiasts, still needs to be watched. Ripped Up Nutrition is pretty transparent as far as quality is concerned. A buyer can request the company to share lab reports for a particular product before actually buying it. Also, buyers can enquire about anything related to the products through the official website. The company also states that the ingredients are all FSSAI approved, thus quality is guaranteed. So far, no side effects have been reported by the users nor the company has associated any side effects with it. However, the product has milk powder and people with lactose and milk intolerance should use with caution. Overall the product seems to be safe. It is available in two pack sizes – 256 grams and 512 grams. The smaller pack is available for around Rs. 850 has 32 servings (one serving is 16 grams). This brings cost per serving to around Rs. 26. If you use it as a pre-workout shake, you would need to get at least 20 grams of protein per serving. This means 2 scoops which would cost you around Rs. 53 which is definitely not reasonable given the fact that this does not even have the additional elements that most protein supplements have. Ripped Up Nutrition Protein Coffee is a pretty innovative product that transforms your average daily coffee into a protein infused meal. Each serving of this coffee gives you 10 grams of pure whey protein concentrate that assists in muscle gain. The caffeine component claims to promote fat burn too. It can be enjoyed as a pre workout and as between-meal snacks but if gaining size and strength is your motto, then we suggest going for other contenders in the market. We rate the product as GOOD.